Learn how to set up and use progress invoicing in QuickBooks Desktop. Progress invoicing lets you split an estimate into as many invoices as you need. Instead of asking for full payment at the beginning of a project, you can invoice customers for partial payments. As you complete work, add items from the initial estimate to progress invoices. This keeps project payments organized and connected from start to finish. If you haven’t already, turn on progress invoicing. Sign in to QuickBooks Desktop as an admin. Go to the File menu and select Switch to Single-user mode. Select Jobs & Estimates from the list of menus. Select Yes in the do you create estimates section. Then select Yes in the do you do progress Invoicing section. Select OK to save and close your preferences. If you need to, go back to the File menu and select Switch to Multi-user mode. Now you can create invoices from your estimates. Go to the Customers menu and select Create Estimates. Fill out the rest of the estimate. Select Save & New or Save & Close. Tip: If you use the jobs feature and want to add an estimate, add it to the job before you start creating progress invoices. For progress invoices, you work from your estimate instead of the normal invoice workflow. Go to the Customers menu and select Customer Center. Find and select your customer on the list. Find and open the estimate on the customer’s page. 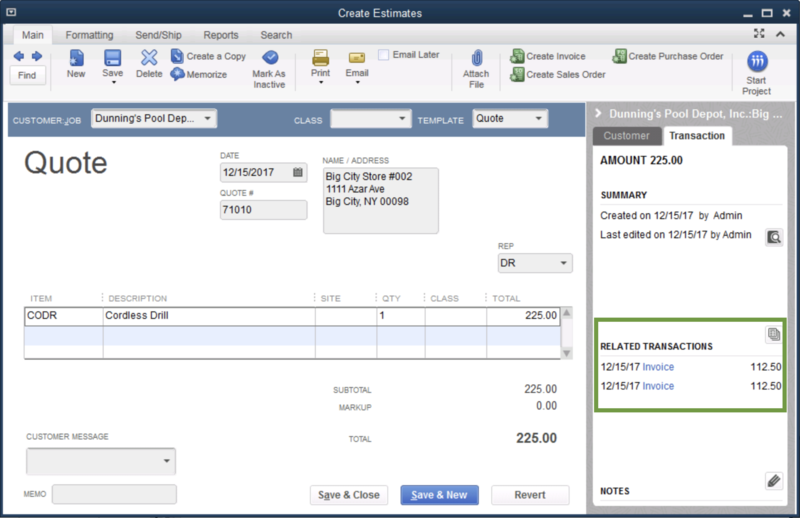 Select Create Invoice from the toolbar. Decide how much you want to charge on the invoice. You can charge for a percentage or a specific amount for selected items. Then select OK. Fill out the rest of the invoice and send it to your customer. Your original estimate won’t change when you create a progress invoice. QuickBooks keeps a record of both. Don’t worry about sending too many invoicesYou’ll get a warning message if you try to create invoices for more than 100% of the estimated total. You can select OK if you want to continue creating the invoice. Review your estimates and reports to stay organized. The panel on an estimate provides useful info, such as the number of open estimates for a customer. To see all the progress invoices you created from an estimate, select the Transactionstab and go to the Related Transactions section. Use reports to keep track of your progress invoices. Go to the Reports menu and select Report Center. Select the Jobs, Time & Mileage from the list. Scroll down to the Job Estimates section. Select a report and then select Run to view it. Check out the Job Progress Invoices vs. Estimates report to track how much you invoice for each estimate.